SwiXml allows developers to rapidly generate graphical user interfaces by writing XML documents defining the layout and content of the interfaces. SwiXml is an efficient java library, capable of instantiating javax.swing and custom objects at runtime. However, all dynamic and data-depending objects, like event handlers, data models, etc, have to be coded in Java. SwiXml is available under an Apache-style open source license. This license is among the least restrictive license available, enabling developers to use SwiXml in creating new products without requiring them to release their own products as open source. Read the complete license here. Much work went into supporting Mac OS X. When running on a Mac, SwiXml renders a Java Swing GUI with a look & feel very close to native Mac applications. Read here, what some developers and users are saying about SwiXml. 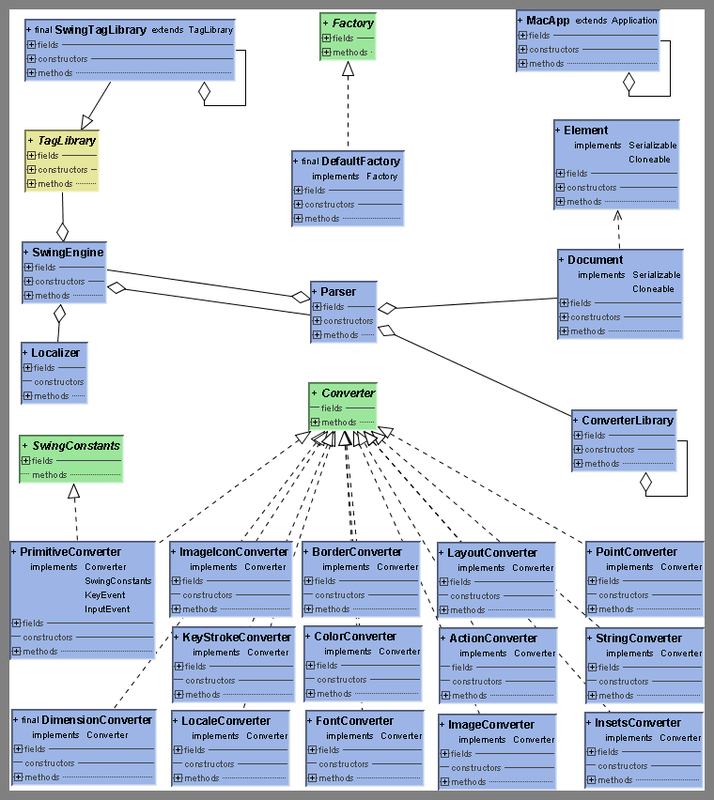 The diagram shows how some of the important SwiXml classes relate to each other. Read here, how to use SwiXml to generate the GUI for an Applet, which loads the XML descriptor at runtime from the applet hosting server. We provide the Swixml source code for anyone who wants it. In general, source code is intended for developers or users who wish to get more involved with the project. Aymie, Software Engineer with Cardiff Software, experimented with Thinlets, Xulux, etc. and was involved with Swixml from the very beginning. I guess it's save to say that today, there is no one who has written more XML descriptors for SwiXml. Frank, a software developer over in Germany, helped writing the parser to support dynamic parameter typing (initclass) and always reminded us when we weren't thorough with the exception handling. Kay continually serves as an advisor to the project, keeping us on the road to Java and XML usability. Copyright ©2003-2015 - Wolf Paulus. All Rights Reserved. swixml.org is a participant in the Amazon Services LLC Associates Program, an affiliate advertising program designed to provide a means for us to earn fees by linking to Amazon.com and affiliated sites.